VATICAN CITY (CNS) — The story of the Christian family includes tales of how its Eastern and Western branches separated, grew apart, attempted reconciliation, hurt each other and now are trying to work together for the sake of the children today and for generations to come. But it is also a story of heroic faith, steadfastness and yearning for unity in the face of danger and persecution, as well as a modern narrative about the challenges and rewards of allowing differences in culture and heritage to enrich the whole family rather than divide it. 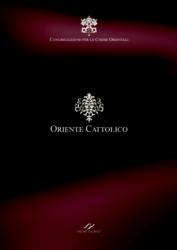 All of those stories, told from the point of view of Eastern Catholics, are recounted in the three-volume, 1,200-page opus, “Oriente Cattolico,” (“The Catholic East”), published by the Congregation for Eastern Churches. Pulling together the family tree and family history took 14 years and involved dozens of scholars, bishops and the heads of the Eastern Catholic churches. The last time the congregation published a comprehensive volume about all the churches it assists was in 1974. The work was coordinated by Paulist Father Ronald G. Roberson, associate director of the U.S. bishops’ Secretariat of Ecumenical and Interreligious Affairs. Before undertaking the massive project for the Vatican, he authored “The Eastern Christian Churches: A Brief Survey,” and has updated that seven times. Work on an English translation of the new volumes is in the early stages, he told Catholic News Service. A swift translation is not expected, he said, but it obviously will not take as long as it took to produce the Italian volume. The Ukrainian Catholic Church is the largest with almost 4.5 million members, and the Syro-Malabar Church, with more than 4.2 million, is a close second. The smallest “church entities” in the book are the Byzantine apostolic exarchates of Greece and Turkey, which together count just over 6,000 faithful, and the Russian Catholics, who are believed to number about 3,000. — Six “patriarchal churches,” that is, those with a patriarch and a high level of self-rule, although in communion with the pope. They are the Coptic, Syriac, Melkite, Maronite, Chaldean and Armenian Catholic churches. — Four led by major archbishops and having most of the autonomy of the patriarchal churches. They are the Ukrainian, Syro-Malabar, Syro-Malankara and Romanian Catholic churches. — Four “metropolitan churches” led by archbishops. They are the Eastern Catholics of Ethiopia and Eritrea; the Ruthenian Catholics in the United States; the Slovak Catholics; and the Hungarian Catholics. — Nine Eastern Catholic communities with eparchies or apostolic exarchates, which are similar, respectively, to dioceses and apostolic vicariates in the Latin-rite church. These are the Italo-Albanian Eparchy of Italy; the Eparchy of Krizevci, Croatia; the Ruthenian Eparchy of Mukachevo, Ukraine; the Exarchate of Sophia, Bulgaria; the exarchates of Greece and Turkey; Exarchate of Macedonia; the Exarchate of the Czech Republic; the Exarchate of Serbia; and the exarchic Monastery of Santa Maria of Grottaferrata, Italy. — Three Eastern Catholic communities without their own hierarchy: Byzantine Russian Catholics, Belarusian Catholics and Eastern-rite Catholics in southern Albania. The divisions and, particularly, efforts to heal them received special treatment in the volumes and not just on the level of the international Catholic dialogues with the Orthodox and the Oriental Orthodox churches. The book, for example, has a separate chapter on ecumenism and the Code of Canons of the Eastern Churches, highlighting the code’s insistence on the obligation of all Catholics to work and pray for unity. The book acknowledges that throughout history many attempts were made to “Latinize” the Eastern churches that were in communion with Rome, making them look and sound more like the rest of the Catholic community. But the chapter on canon law insists the Eastern Catholic communities contribute to the search for Christian unity by being themselves and maintaining their liturgical, spiritual, theological and even disciplinary traditions, which, for example, can include having both celibate and married priests. For the past 50 years, the popes have insisted that as the task of healing the divisions in the Christian family proceeds, respect for the identity and heritage of the Eastern churches demonstrates that the re-establishment of full unity would not mean smaller members of the family would be asked to sacrifice their identity.